Christmas is the time when people choose to celebrate their love of the holiday and their own personality by decorating the inside and the outside of their home. The following decorations may show a little too much personality and not enough Christmas. I’m not sure this is good for the sanity of the neighborhood children. After all it is only a matter of time before they ask their parents just what the reindeers are doing. Though this will certainly cause everyone to take a second look when they walk or drive by. Now this is a tree that really makes sense, after all most trees either end up on the curb or back up in the attic, but now once Christmas is done, the party can really begin. It is always great to have to a reason to celebrate after the holiday season, maybe this is what they mean by the gift that keeps on giving. Though you might have to deal with a few comments about it being tacky, that is until they realize the after Christmas benefits. Now I’ve put up Christmas decorations every year and my husband tries to put a bunch of lights up on the house but this strategy seems so much easier. Now all you have to do is live next to the crazy overachiever who spends hours putting up his lights and then create your own little expression of the holiday season. Strangely enough the guy who spent less time now get the most credit for being hilarious and creative. No More Ho Ho Ho! I’m not sure that this family is going to get any Christmas presents this year and I really hope they don’t have any children that believe in Santa Claus. I’m not sure this is a threat to ward Santa off against breaking and entering in the guise of dropping of presents or retaliation for whatever he didn’t bring the previous year. Now I guess Santa felt it was time to upgrade from that old-fashioned sleigh to something a little more modern but I can’t imagine that tiny Volkswagen being the best way to carry all those presents, heck I can hardly imagine Santa easily fitting inside. I would also expect that Santa would at least have the elves make a new car something with some jets to help those poor reindeer fly. This is yet another way to terrify the kids in the neighborhood. A special added touch would be to add a big shiny red nose to make sure that everyone knows just which reindeer met his untimely end. I do like the addition of the red string lights to act as dripping blood all over the tree stump. Though I think it could use a few more lights just to draw a bit more attention. This decoration is reputedly to have caused a big stir as people risked life and limb to save the man they thought had fallen. But even so this is perhaps one of the craziest decorations and the most interesting that I have ever seen because it definitely took a great deal of planning. I also think it is one of the few light decorations that is cooler during the day rather than at night. This is a great way to draw unwanted guests to your home. It brings attention to the fact that you either have plenty of beer kegs or it is no unusual for your house to have a beer keg or two lying around. The idea of having plenty of beer is a surefire way to have people stopping by your home at all hours. 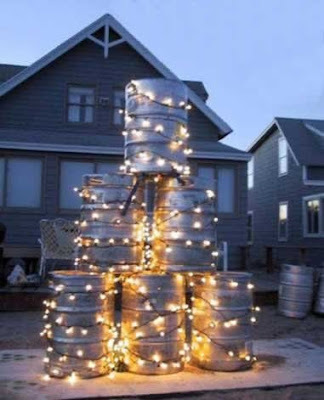 Though my first thought would be to put the lights on the house instead of creating my own structure out beer kegs for the lights. When one tree is just not enough get two, but the great thing to do is that when your family starts getting drunk you invert one of the trees, that way they get REALLY confused. Though I really think that the decorations look better upside down anyway, the downside is that you really don’t hide the presents as well. 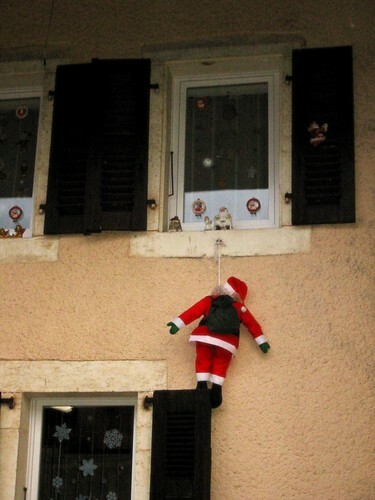 Now I really thought that Santa had more class that this. After all I mean he’s supposed to be sending an example for kids and if peeing off someone’s roof is considered good behavior. Then again I think I have a pretty good chance of being on the nice list because apparently the standards are getting really low. But you have to wonder sometimes drinking all that milk…and I really don’t think that sled is equipped with a bathroom. Spend this Christmas bringing smiles to people and enjoying your Christmas decorations but perhaps there is something to be said for being just a little too creative, after all some of this decorations might just make your neighbors wonder.